Welcome to Sunsets over the Salish Sea on the beautiful north shore of Orcas Island! This home offers gorgeous views from so many locations on the property it's hard to count! This photo shows a set of luxury deck chairs and a dining table setup on a raised deck just in front and to the right of the house. 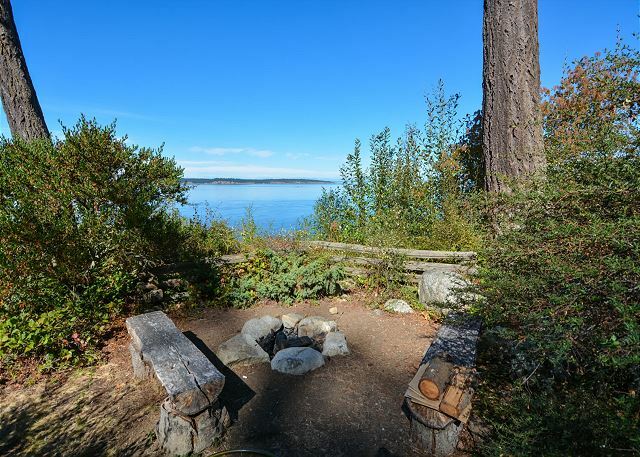 An outdoor fire ring right next to the water provides a location to see beautiful views of Sucia Island while enjoying an island staple - s'mores on the water! Views north to Sucia Island from the waterside of the property. An orange sky at sunset over the outer islands, all visible from this amazing property! Spacious, tastefully decorated and oh so cozy. A close up look at the living room fireplace. The kitchen features a double oven, dishwasher, granite counters and bar stools. Not a bad view to watch while cooking that special vacation feast. The dining room table is located in between the main living room and kitchen. 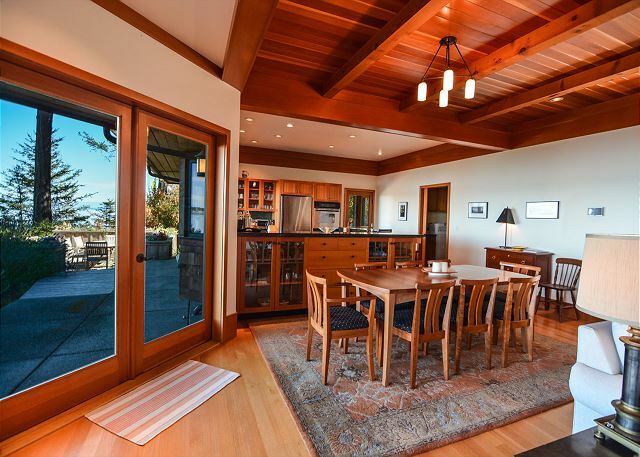 The gorgeous woodwork includes a handmade, custom dining table. One of the four bathrooms in the house. A den on the lower level has a pop-up queen size sofa bed, TV, and a separate exterior entrance. The library is between the master bedroom and living room. It features bookshelves and a TV enclosed by custom cabinets. 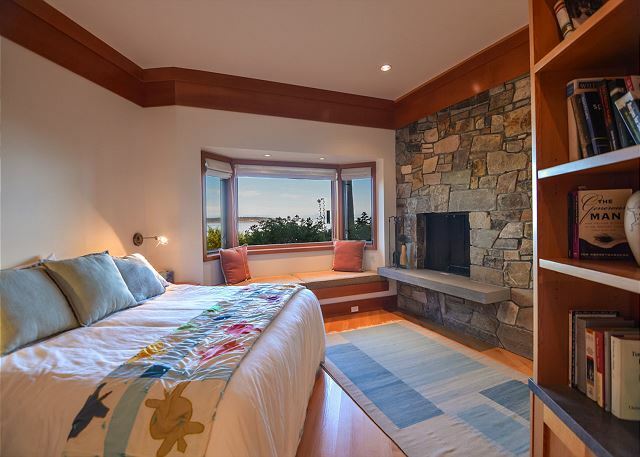 The master bedroom offers a king bed, twin window seat, rock fireplace, bookshelves, and a desk. This third view of the master bedroom shows a writing desk and in room library. The master bath features dual vanities, walk-in shower, private facilities, large closet and lots of custom shelving and high end touches. The master bath shower has two shower heads and other luxury features. 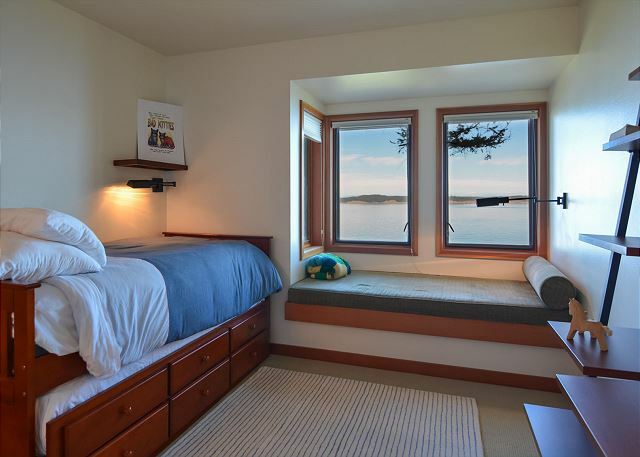 The upper guest room has a queen bed and twin window seat for those lazy late afternoons with a book. A close up photo of the bed and its view. A view of the writing desk and window bed. Each upper bedroom offers an ensuite bathroom with tub/shower. Upper guest room with trundle bed + twin size window seat. A tub shower combo with sliding glass door. Desk on upper level landing. A view of the step down deck. This is a great place to soak up the sun and enjoy the setting. A lovely spot in the garden. The gate to the front entrance and path looping though side gardens to the water view. What a great island perch! The hot tub location is shown in the middle right side of the picture. This shot is looking west. 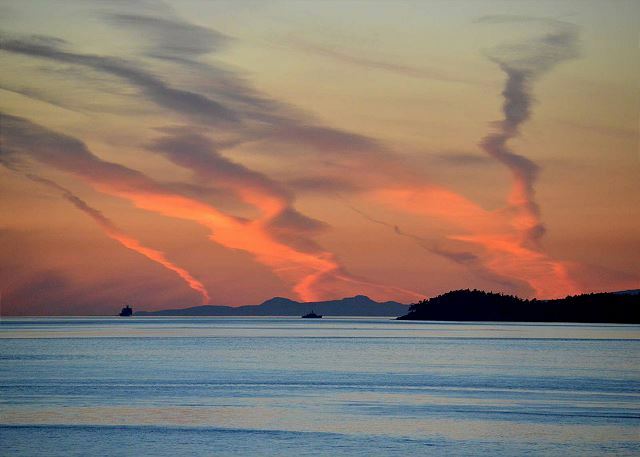 We hope you have enjoyed this look at Sunsets over the Salish Sea. Here is a picture of a sunset from the property that we think you will enjoy. Can you imagine seeing this sunset yourself? 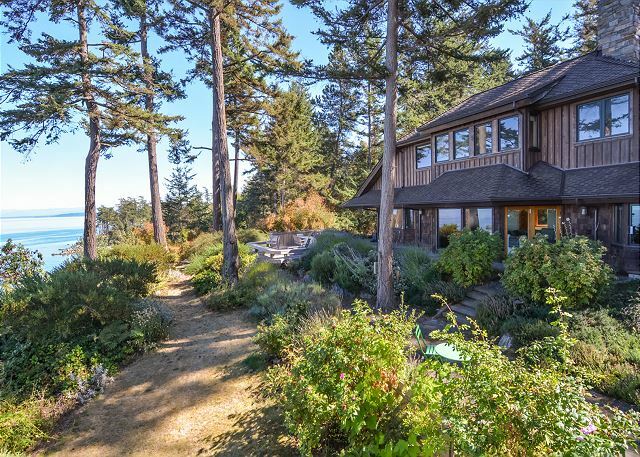 CUSTOM ORCAS ISLAND WATERFRONT HOME WITH HOT TUB, 3+ BEDROOMS, 4 BATHS, NEAR EASTSOUND. This appropriately named vacation home faces northwestern skies that become a brilliant spectacle of gold, orange, and purple at days’ end. 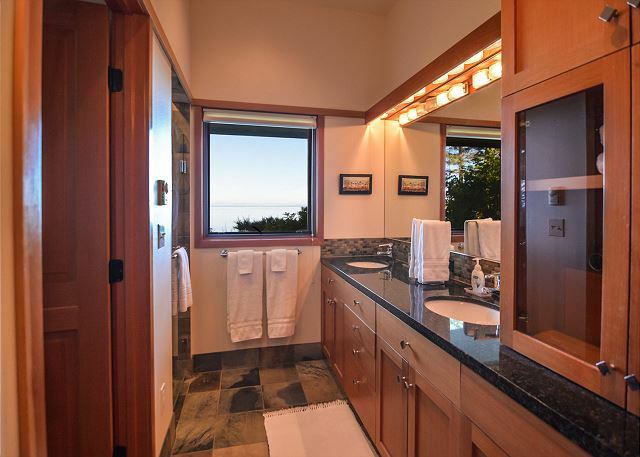 This glorious panorama is yours to behold when you stay at Sunsets over the Salish Sea. From the vantage point of the seaside hot tub or dining terrace, sundown can be a very special event indeed! But this beautiful home has much more to offer than the lovely water view. As you enter the property through a gated drive and lushly landscaped grounds, the substance becomes apparent. Sunsets was designed by a premier local architect and the quality of construction is superb. Completely furnished top to toe with new high end products, this property will satisfy the most discriminating guests. The interiors are customized with quality woodwork and cabinetry, a dramatic stone fireplace that stretches across a wall, and signature window seats tucked into cozy bedroom nooks. On the main level, the great room features gorgeous hardwood floors, gleaming wood ceilings, and an open kitchen with granite counters, bar seating, and stainless steel appliances. A small den with a TV separates the living room from the master bedroom. For guest audiophiles, a sound system with a wonderful set of speakers and a variety of music options is also available. The master bedroom features a desk, second rock fireplace, king size bed, and window seat that might serve as a sleeping space for a child. The en-suite bath is accented with slate tile and offers a large dressing area, dual vanities, private facilities, and walk-in shower. On the opposite side of the main level, the hall leads to a washer/dryer, a guest bathroom with stall shower, and to a bedroom set up with TV and deluxe sleeper sofa with a pop-up section that creates a full-size queen bed. This room also offers a separate exterior entry from the courtyard. Two additional guest rooms are upstairs, each with their own en-suite bathroom with tub/shower. One of the rooms offers a queen size bed, the second bedroom has a trundle bed with pull out twin bed. 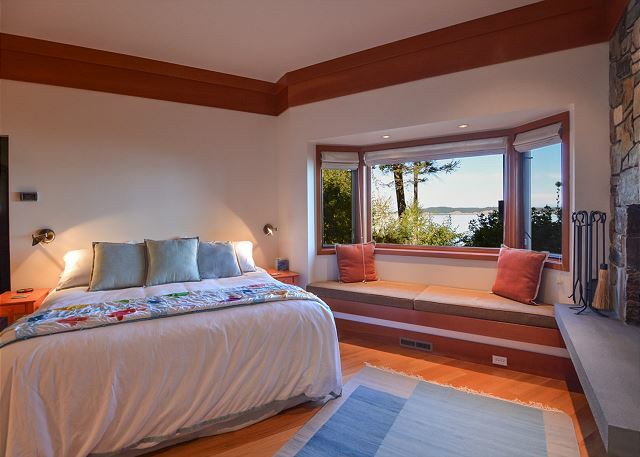 Both of these rooms also feature twin-bed size window seats for extra sleeping versatility. Outdoors on the waterside, you’ll find the propane BBQ, the hot tub, a flagstone terrace, a fire pit, and a stepdown deck area with lounge chairs and a dining table. The home is also enviably located within an easy bike ride of Eastsound Village, shops and restaurants. 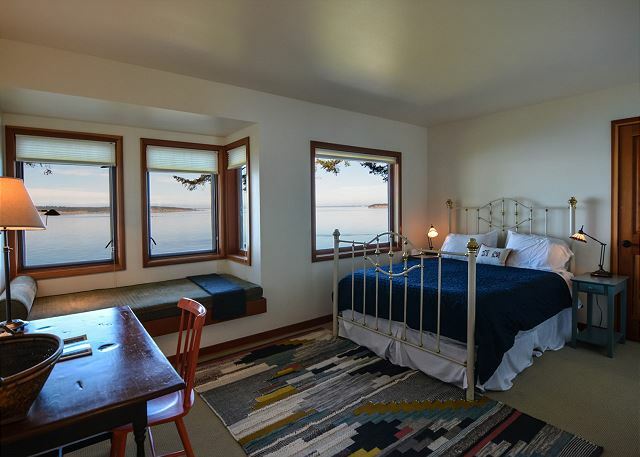 Waterfront, 3+ bedrooms, 4 bathrooms, hot tub, new furnishings, plus located near town - Sunsets over the Salish Sea has everything that vacation guests are looking for! Rooms Sleeps 9, Beds are twin/trundle in 3rd bedroom and sleeper sofa that pops up easily to a queen bed. Three window seats are twin size mattresses. Place was clean and lovely. Hot tub had an issue the first night but was fixed right away. Staff was easy to get a hold of and quick responses. Overall, we all thought the place was magnificent! Great house, property and location....fabulous views out of alll windows, nice walk to Eastsound, great kitchen, decks and space. ONLY complaint is a couple of mattresses could be improved on...but our time there was so filled, that we all collapsed once we hit the beds. Stunning house and fabulous stay. We rented this home for a family reunion to celebrate my wife's birthday. The home was perfect! The location is outstanding. The home was very clean, well cared for, fully equipped and met all our expectations. We had a catered birthday dinner for 10 on the deck looking out over the Salish. The kitchen worked well for the catering crew. It was a perfect evening. We had a terrific stay at Salish Sea. The house is spacious and nicely equipped. We were particularly impressed with the kitchen, as we're not used to good gadgets, knives, small electrics, etc. when we've rented vacation houses in the past. The house's best feature is its proximity and views to the water. We enjoyed all of our evenings eating on the deck, watching bees dart in and out of the lavender, and marveling at the beauty of the water. We were a family of six persons - Grandma, Grandpa, our daughter, her husband, and their two kids ages 9 and 11. We all loved having separate bedrooms and bathrooms, outdoor sitting and dining areas, and the hot tub. Sunsets and sunrises were amazing. The view from the living room and kitchen were mesmerizing. Kitchen was stocked well with cooking gear. The gas BBQ was wonderful. Saw a bald eagle and a woodpecker by the house. The best family vacation we have ever had. We asked for views and got so much more. A beautiful home with beautiful gardens. This is a great place a group of friends or families with adult children as the bedrooms have private bathrooms. The home is very well maintained and pretty close to town. We rented bikes for the week it was an easy ride to most places. We had a wonderful stay in this Waterfront home. Beautiful views and property. We took advantage of the hot tub and were so impressed with the beautiful landscaping around the house. The interior craftsmanship is impressive. We had one issue with a need for more bedding for the fold out couch which was taken care of quickly by the property management. This is a fabulous spot to visit with friends and family or just sit by ones-self and contemplate the beautiful world in front and around you. This was the best vacation rental experinece our family has ever had and we have had many, including our own wonderful vacation home on a fine Minnesota lake. We appreciated the many details of design and landscape that made this place exceptional. We have a chef in our family and he enjoyed the kitchen, as we enjoyed his cooking! The deck was the icing on the cake. My fmily vacation home is just 3 doors down so it felt like coming home only better! The weather was cool but cooperative- out of the southern prevailing winds.THANKS FOR SHARING THIS HOME! Fantastic time. Beautiful home. Felt so very comfortable and an incredible resting place. We traveled to Orcas Island for a week in June with our two kids, ages 9 and 13, plus both sets of grandparents. This property was perfect for us! Kitchens such a beautiful space and such fun to cook in! However, it needs an overhaul in terms of how space is used and what cooking utensils are available and in good form. This house and property were spectacular- comfortable, large, beautiful, fabulous views of the water, perfect location. We looooved it and definitely want to come back. Our family had a wonderful time in this beautiful home. The setting is magical and the home quite spacious and comfortable. This home is well equipped and beautifully decorated. You can tell the owners really care about this property and the management company handled all teansactions well. My only suggestion is that renters be warned about the pine sap. The trees drip on everything and if it gets on clothes it doesn't wash out. This home was absolutely beautiful and the views were incredible. We would definitely stay here again. 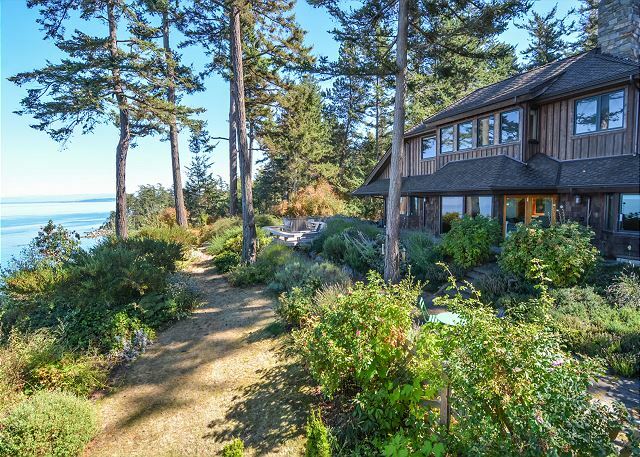 The location of the home was perfect - quiet and secluded but close enough to Eastsound that you could walk. The kitchen was stocked with so many staples for cooking - salt, pepper, etc. We have stayed in homes on Orcas Island before that had nothing in the kitchen so this was a pleasant surprise. It really felt like a home. There were so many great books to read in the house - unfortunately, we didn't have time to read! There were a lot of bugs in the house (and we didn't leave the doors open, etc). We had flies (and I couldn't find a fly swatter), gnats, spiders in the house all week. There was so much tree sap on the deck by the outside dining table that we never enjoyed a meal outside. The hot tub outside was great and was in the perfect location. Do wish it had been a little cleaner, though. All in all, this is definitely the nicest house we have stayed in while on Orcas and we would love to stay here again. Beautiful views and spacious home for family vacation. We were very happy with the home and location overall. The major disappointment was that the upstairs air conditioning did not work. New ac was on order. The nights were cool enough that with windows opened we were comfortable. We have family members with allergies and it would have been nice to have advance notice that the ac was not working upstairs. Home was clean but noticed cobwebs on the kitchen countertop/cabinets and kitchen floor needed to be swept. Only one washcloth in master bath. Loved the well-equipped kitchen. Hot tub was great! We just returned from spending a glorious week at this property. The home is in wonderful shape and has amazing views. The only drawback is the amount of sap that drips from the large middle tree. Guests should be warned. We got sap on our shoes, clothes and bodies. It made sitting outdoors not as pleasant. Beautiful location, tastefully furnished. Like staying in a Pottery Barn home on the water! We would definitely return! We had a fantastic vacation week and rental experience. The house location could not have been better, quiet, secure, and right on the water to take advantage of seeing eagles right in our own tree, sea otters, and beautiful sunsets. The house was clean and comfortable for the five of us. We used the deck several times, the barbeque, and the hot tub a couple times. We all loved the collection of books and made us wonder what the career is of the homeowners! Two small issues, after searching,we actually found the binoculars on our last evening; they were in a black case, sitting on the black counter!!! We would have loved to have those earlier in the week, even two sets. Second, the TV room seemed to have many spiders and odd bugs - - we did not spend much time in there! This is our second time renting this lovely vacation home and again we were extremely pleased with the location, the layout (which is perfect for two families) and the fact that you are able to take a long, safe walk into town. Disappointed that once again there wasn't any comfortable laying out and reading deck furniture or an umbrella to protect oneself from the sun. The home is beautifully furnished with a wonderful layout, is clean and in a great location. We had a wonderful time and also enjoyed the hot tub. It would enhance the view even more if the shrubbery obscuring the view could be cut back, if possible. I would also place a couple of lounge chairs on the back deck. There is no place to relax and enjoy the beautiful view, other than a straight-backed dining chair. We had an issue with working the grill on the first night, so the management company sent someone right out, which was great. We had an extraordinary experience! The kids squealed with glee when they entered, and my mom whimpered just a few hours later, "I don't want to leave!" The house was gorgeous and impeccably designed. We wanted the floorplan to see if we could ever build a house like it. Our favorite was the deck, yard, hot tub, and of course the majestic views. Flawless cleanliness and amenities. A truly fancy experience. Thank you for a great vacation! YOU ARE WELCOME! See you next time! This home and the surrounding grounds/view was absolutely beautiful! 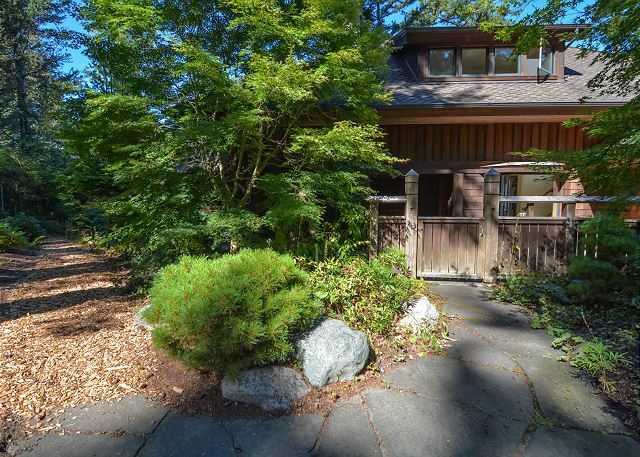 The house is on a very secluded street and very quiet but close enough to Eastsound to walk if you want. Our family very much enjoyed our stay at the house and are looking forward to (planning) returning again in the future. We loved Orcas Island and our stay at Sunsets Over Salish.